Singapore’s second Earthcache will explore one of Singapore’s oldest geological formations, the Gombak Norite, named for the hill (Bukit Gombak) where the evidence of this formation occurs most prominently. Geologically speaking, the oldest parts of the island of Singapore can be traced to the Palaeozoic era (550 – 250 million years ago). 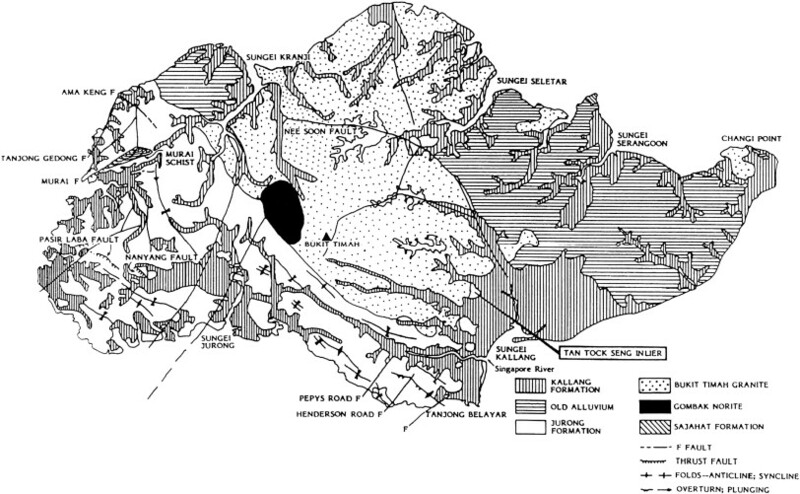 Three different rock formations in Singapore were believed to have been formed at this time: the Sajahat formation (the oldest formation, named for Pulau Sajahat where they occur); some volcanic rock outcrops on Pulau Tekong and smaller islands in the northeast; and of course, the Gombak norite. Gombak norite is been found here at Bukit Gombak and to a lesser extent at Bukit Panjang, where they have been quarried extensively in the last century, forming the picturesque landscapes that now dot the Bukit Batok HDB town, including the nearby Little Guilin. The Gombak norite is surrounded by the more recent Mesozoic (250 – 65 million years ago) rock formations. In the west, it is bordered by the Jurong Formation (made up of sedimentary rocks) and the Bukit Timah granite batholith in the east, which is the largest rock formation in Singapore, providing the bedrock for most of the island. The Gombak norite is of mixed composition, ranging from its namesake noritic rocks to gabbro (a rock similar to norite, but with a slightly different chemical composition). The Gombak norite formation rests on top of the Bukit Timah Granite, which means that the norite was pushed up to form the outcrops seen today by the granite due to tectonic activity. At some points, the granite has cut and assimilated into the norite formation, and both of these observations provide proof that the Gombak norite predates the Bukit Timah granite. 1) Igneous: There are three main groups of rocks: Igneous, sedimentary and metamorphic. Igneous rocks, from the Latin ignis, meaning fire, are rocks that a formed from the cooling and subsequent solidification of magma in the Earth’s mantle or lava from volcanos. Igneous rocks are by far the most abundant rocks in the Earth’s crust, making up 90 – 95%of its volume. Familiar igneous rocks would be ubiquitous granite, basalt, gabbro, andesite and quartzite. 2) Intrusive: Igneous rocks can be further divided into two types, intrusive (or plutonic) and extrusive. Intrusive rocks are formed when magma cools within the Earth’s crust and some of them are subsequently pushed up to the surface due to tectonic activity. The defining feature of intrusive rocks is that they tend to be course-grained due to their slow cooling. Examples of intrusive rocks are granite and gabbro. In sharp contrast are the extrusive rocks, which are formed when lava which erupts from volcanos cool quickly on the Earth’s surface. There are normally fine-grained, occasionally with gas bubbles within. Examples include basalt and the beautiful glass-like obsidian. 3) Mafic: Mafic describes the elemental composition of the rock, and refers to the large percentage of iron-magnesium minerals present in the rock and mafic rocks tend to be darker in colour. Mafic comes from the blending of the words MAgnesium and FerrIC (iron-rich), as opposed to felsic rocks (like granite) (FELdspar and SIliCa) which contain more silicon, potassium, sodium and calcium minerals and tend to be lighter in colour. So, from the above descriptions, we can conclude that norite and gabbro are iron and magnesium rich rocks formed from the cooling of magma deep in the Earth’s crust. The difference between gabbro and norite lies in the presence of a different forms of a mineral known as pyroxene. Norite contains more orthopyroxenes, while gabbro contains more clinopyroxenes. The difference between the two cannot be easily discernible by the naked eye and can only be seen under a microscope or magnifying lens. For the purposes of this cache, you may assume these two to be one and the same. At the published coordinates, you will find examples of Gombak Norite rocks protruding from the ground. The quarries in the vicinity (Little Guilin and the Seng Chew Quarry are also excellent examples of the norite formation). I do encourage you explore these abandoned quarry parks if you have the time. But, if you’re in a hurry, just study the rocks in at the published coordinates. 1. DESCRIBE the characteristics of the Gombak norite. In particular, pay attention to the colour, roughness, texture, hardness and grain-size of the rocks you see here. You may want to bring a ruler (with at least millimetre markings) to help with the description of the grain-size. 2. The above is a photo of granite, a very common igneous rock found in abundance at nearby Bukit Timah. COMPARE the characteristics of the rocks found here with granite. What similarities and differences can you see? Can you suggest reasons for these similarities and differences? Repeat this task for basalt (Fig. 2). 3. Optional: If you’re feeling adventurous, check out the quarry at this coordinates (trailhead: N01 21.726 E103 45.157, actual location N01 21.674 E103 45.217), which is not too far a hike from the published coordinates (but bring/wear appropriate gear). You may post a picture of your hike and visit there in the logs. Send the answers to me via e-mail to me. I’m not too particular about whether you log first, and e-mail later or vice versa, but as long as I get a response within a reasonable period of time (a week or so) from a log, I won’t delete it. Have fun! Chia, L. S., Rahman, A., & Geography Teachers' Association of Singapore (1991). The Biophysical Environment of Singapore. Singapore: NUS Press. Lbh znl abgvpr gung fbzr fznyy cbegvbaf bs gur ebpxf ng choyvfurq pbbeqvangrf erfrzoyr tenavgr. Guvf vf xabja nf n krabyvgu, n pbzzba bppherapr va vtarbhf ebpxf jurer bar glcr bs ebpx rairybcf nabgure. Vs lbh'er cynaavat ba pbzcyrgvat vgrz 3, sbyybj gur qenva sebz gur genvyurnq gb vgf "ybtvpny" pbapyhfvba. Fgrrc fybcr nurnq, fb jrne tbbq fubrf naq oevat n uvxvat cbyr vs arrqrq.